Cast-on-itis. It's a real thing. Common symptoms include trolling Ravelry for hours picking out a half a dozen patterns you need to knit right away, scrambling to find the right needles, pulling old projects off said needles to cast on, wanting to do nothing but knit, daydreaming about your knitting project while doing chores, getting up at the crack of dawn to crank out a few rows, and the list goes on....and Katie and I are both suffering from this 'ailment'. 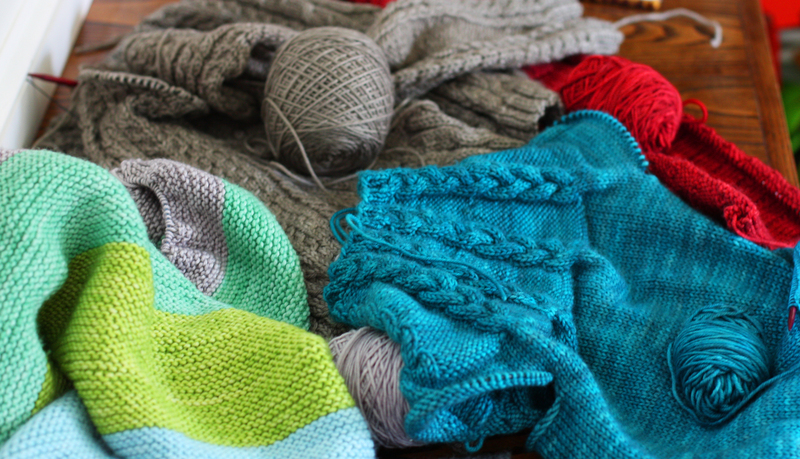 Lately, we've been feeling pretty inspired by all of the beautiful projects we've seen and we're so passionate about our own yarns that all we want to do is cast on new projects and knit them as fast as possible. 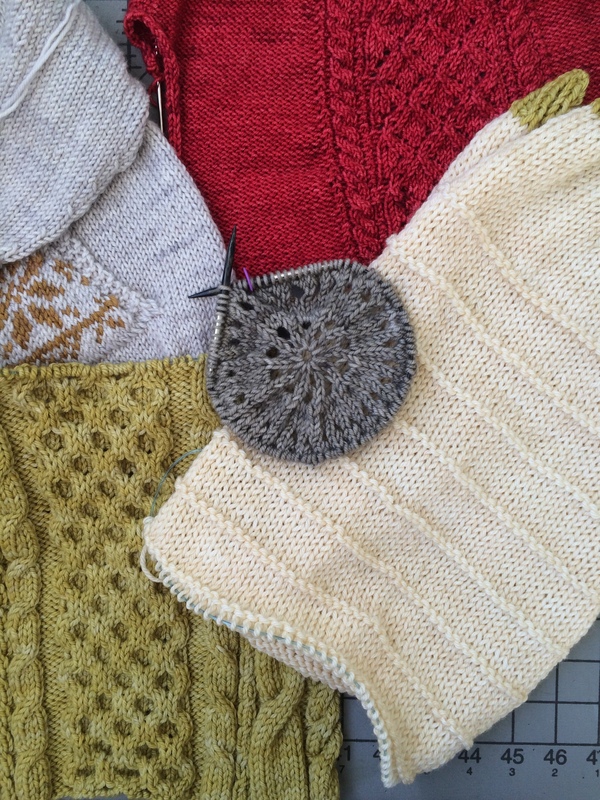 Right now I have 5 projects on my needles that are all calling (or shouting) my name. That doesn't include the old unfinished projects stashed in a closet somewhere. No, these are all gorgeous knits that I'm still so in love with that I'm having a hard time deciding which one to pick up and knit when I have a few minutes. I'm even representing most of our yarn weights. I have 2 projects cast on in DK, 2 in worsted and 1 in sport. In this pile of goodies you'll find - A test knit for byannieclaire - Girasole by Jared Flood of Brooklyn Tweed - Fisherman's Dream Pillow by Nice & Knit - Gale by Alicia Plummer - Berenice by Julie Hoover In total we have a baby knit, a toddler knit, a blanket, a pillow and an adult knit on the needles with 2 deadlines before Thanksgiving and 3 by Christmas. Now that's variety! This is Katie I have been knitting every spare minute as well, and I have a major case of cast-on-itis! Believe it or not, I feel that I have had a lot of restraint. Like Kara, I also have a test knit on the needles, I am working on Travelling Dress for Joji Locatelli. (a designer that I admire greatly!) I am so excited to be testing this dress for her! I think that I may do a sweater length instead of a longer dress but I am still deciding on that! Purl Bee bias blanket is still being worked on (Darren is somewhat patiently waiting for me to finish that for him) I am working on Hello Winter still, and really do not have a long way to go on that! A couple days of real dedicated knitting would have it about wrapped up! I have a few pattens that I am truly itching to cast on so this pile may grow in the next few days ;) I love the fall for this very reason, the ideas keep flowing and my hands keep knitting. I understand your ailment :) And I can’t wait to see pictures of your finished projects! Me three…I try to limit myself to two projects at a time but it’s not easy. So much easier to start than it is to finish!